ACQUISITION Lodger facilities for an RN Air Section at an RAF station. 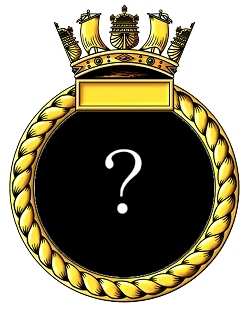 Facilitates for 2 disembarked squadrons (24 aircraft). Fleet Requirements Unit (788 squadron). 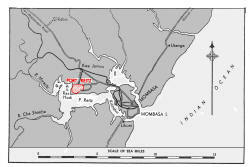 The airfield lies on a plateau at Ras Hodi, 3 miles W. of Mombasa Island, on the N. shore of Port Reitz, the inlet extending westward from that island. Kilindini harbour and wharves lie 3 miles ESE. R.N.A.S., Mackinnon Road, lies 40 miles WNW. 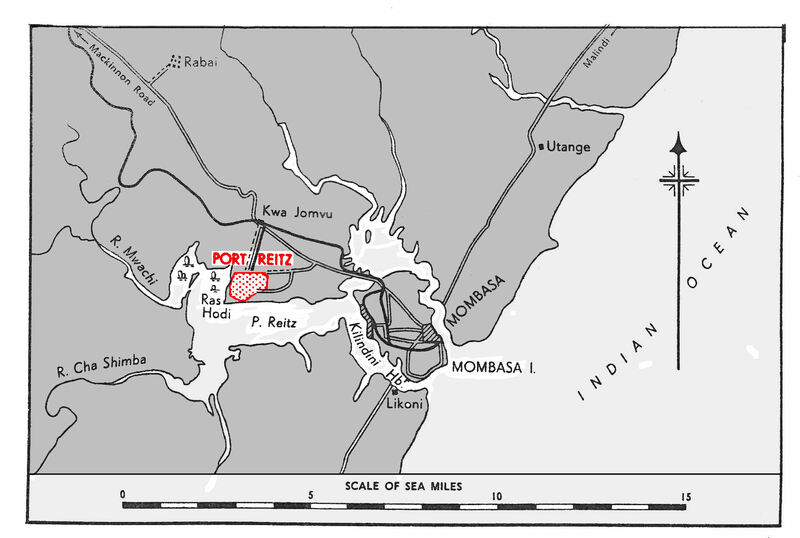 Mombasa Island, Kilindini harbour and Port Reitz. ACCESS 6~ miles (R). The road to Kilindini is suitable for the transport of aircraft. Railway station at Kwa Jomvu, on the main Mombasa-Nairobi line ; a branch line runs N. from the NE. corner of the landing area to connect with the main line. Kilindini harbour has 5 deep-water berths served by railway tracks. There are several 3- and 5-ton electric mobile cranes one 10-ton crane and a 6o-ton floating crane available. Control Building 350 yds. ESE. of main runway intersection. 09/27 QDM. 093°/273° .... 1200 X 40 yds. 15/33 QDM. 153°/333° .... 1530 X 40 yds. 03/21 QDM. 053°/213° .... 800 X 40 yds. 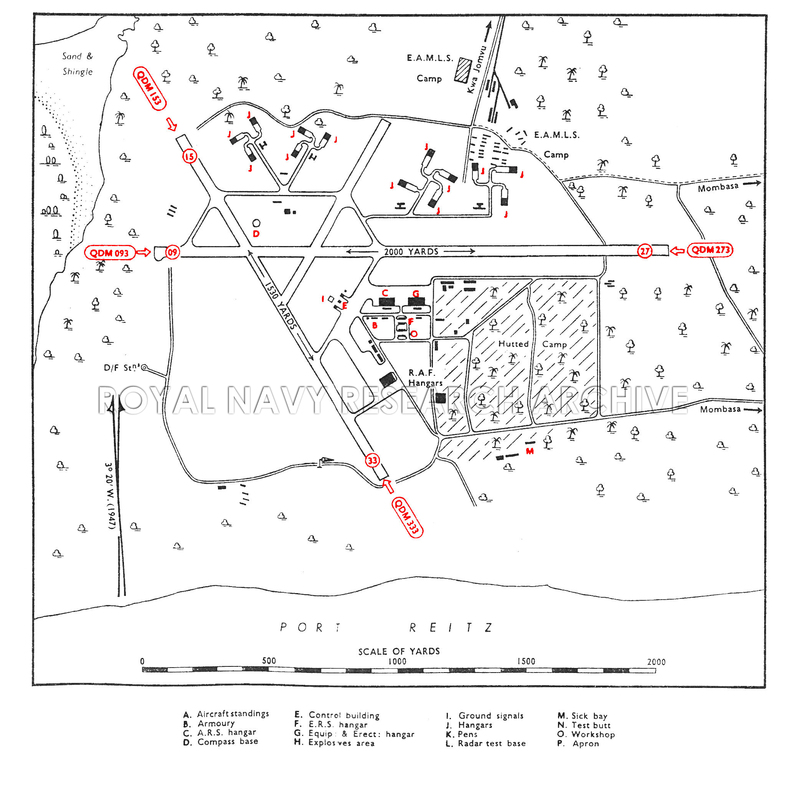 40' tracks to Naval Air Section Squadron areas. 5o' tracks connecting runways with one another. Circuit - 4 W/T masts, 18o', distant about 2,SOO yds. ENE. By night - Landmark beacon at airfield, flashing in red the letters "PR"
By night - Portable electric Glim lamps. Chance light. Gooseneck emergency flare paths. W/T station at airfield. 2 R/T channels maintained. 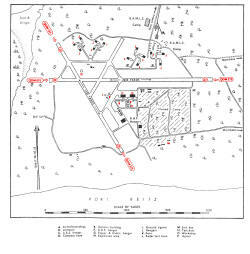 Living quarters in camp on E. of the airfield, (shred with R.A.F.). ARMOURIES One small Naval Air Section Armoury. COMPASS BASE One, concrete, diameter 70' (shared with R.A.F.). DISPERSAL Runway 03/21 is used for dispersal, also the area on the W. side of the airfield, S. of runway 09/27. There are also two R.A.F. hangars on the SE. side of the airfield. MEDICAL R.A.F. Sick quarters on SE. side of airfield, S. of Mombasa Road, accommodation for 30 Naval ratings only. METEOROLOGICAL Air Ministry provide facilities; office in the control building. There is a Naval Meteorological liaison officer. Rainy Seasons : April-June and November and December. Heavy afternoon showers prevalent throughout the year. Facility shared with R.A.F. 3 underground storage tanks with a capacity of 11.300 gallons each. tank, and 3 with a capacity of 6,000 gallons each. TEST BASE Non a/c radar test base. WORKSHOPS One A.R.S. hangar (Callander, 185' x 100' 25' x 100'), one Equipping and Erection hangar (Bellman, 187' x 80'), and workshops to two squadron scale. equipped with Albacore. Fulmar, Sea Hurricane, Skua and Swordfish. Formed here out of 818 squadron 25.07.1942. Moved to RNAS Tanga 30.09.1942.
equipped with Albacores and Swordfish. Disembarked from HMS FORMIDABLE 10.05.1942, re-embarked 25.05.1942. Disembarked from HMS FORMIDABLE 122.08.1942. Moved to RNAS Tanga 29.08.1942. Disembarked from HMS ILLUSTRIOUS 12.12.1942, moved to RNAS Tanga 12.01.1943. Disembarked from HMS INDOMITABLE 23.05.1942 'A' flight re-embarked INDOMITABLE 11.06.1942. Squadron moved to RNAS Tanga 20.06.1942. Detachment (?) disembarked from HMS ILLUSTRIOUS 25.08.1942 - 06.09.1942. Detachment (5) disembarked from HMS HERMES 09-14.10.1941. Entire squadron disembarked 15.10.1941. Disembarked from HMS FORMIDABLE 20.04.1942, re-embarked 26.05.1942. Moved here from RNAS Tanga 06.07.1943. Disbanded here 30.12.1943. Disembarked from HMS INDOMITABLE 22.05.1942 re-embarked INDOMITABLE 10.06.1942. Disembarked from HMS INDOMITABLE 16.06.1942 re-embarked INDOMITABLE 09.07.1942. Kipanga is Swahili for Hawk.